Accurate 3D Computed Tomography (CT) digitalization of materials has numerous applications and is vital for future realistic numerical simulations of the material's macro characteristics. In the same time, it is a quite difficult task due to the presence of various imaging artifacts as well as the usually complex micro-structure of the real object. Thus, advanced image processing techniques, adapted to the problem specifics, need to be used. The goal of this project is the development of innovative mathematical models for image denoising and image segmentation that are well-suited for the CT reconstruction of porous data. 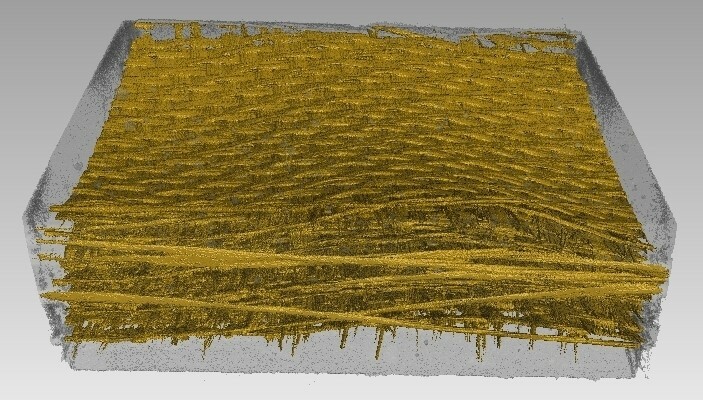 For example, physical characteristics of the material, such as exact volume or spatial connectivity, can be incorporated within the models and inherited by its digital reconstruction. If time permits, numerical algorithms for solving the model-based optimization problems should be proposed and implemented. 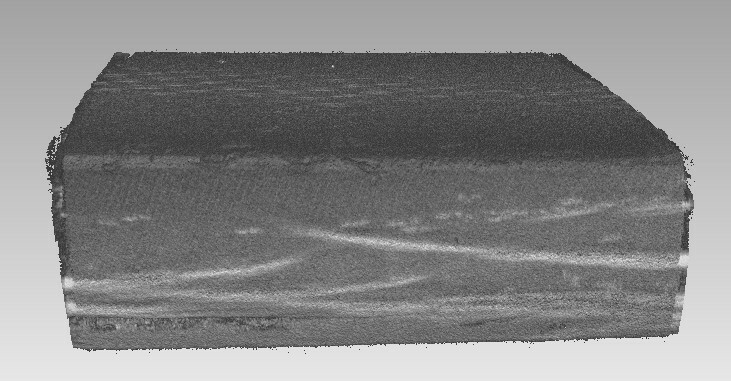 Then the adequacy of the models can be analyzed on real industrial CT data. Mathematical Background: Basic knowledge of Convex Analysis, Linear Algebra and Numerical Methods; Image Analysis and Matlab programming skills are welcome, but not obligatory. References and additional materials: download. Participants: Dennis Wenzel (Technische Universität Dresden, Germany), Jaume de Dios Pont (Autonomous University of Barcelona, Spain), Sebastian Ståhl (Chalmers University of Technology, Sweden), Vladyslav Khyzhniak (Lappeenranta University of Technology, Finland), Zdravka Nedyalkova (Sofia University, Bulgaria). There are several engineering processes where the free surface of a molten metal is shaped by electromagnetic forces. The control of these surfaces leads to various mathematical questions and requires numerical simulation. In this project we will restrict ourselves to a 2-dimensional model, it concerns the case of a vertical column of liquid metal falling down in an electromagnetic field created by conductors. 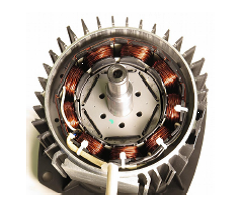 We assume the frequency of the imposed current is very high so that the magnetic field does not penetrate into the metal and the electromagnetic forces are reduced to the magnetic pressure acting on the interface. Under suitable assumptions, the equilibrium configurations of the liquid metal are described by a set of equations involving a relationship between the electromagnetic, superficial and gravity forces at the boundary. The equilibrium shape is shown to be stationary state of the total energy assuming that the surface is prescribed. The total energy depends on the solution of an exterior Dirichlet problem. The aim of this project is to propose a numerical method to compute the equilibrium shape. This needs classical shape optimization technics, and boundary element methods (BEM) to compute a numerical approximation of the solution of the exterior Dirichlet problem. Mathematical Background: Elementary Nonlinear Optimization with constraints, Numerical Analysis, Finite Elements and Matlab. Participants: Andreas Schafelner (Johannes Kepler University Linz, Austria), Andreas Söderlund (Lund University, Sweden), Arnaud Bonnet (University of Strasbourg, France), Juan Ignacio Bedoya Cabanelas (University of Santiago de Compostela, Spain). Mathematical Background: PDEs, Numerical methods for PDEs, Optimization, Programming skills. Participants: Anne Ryelund Nielsen (Technical University of Denmark, Denmark), Lea Miko Versbach (Lund University, Sweden), Pedro Rodriguez-Barbeito (University of Santiago de Compostela, Spain), Robert Bauer (Technische Universität Dresden, Germany), Szymon Sobieszek (Wroclaw University of Science and Technology, Poland). Diseases of the anterior segment of the eye are mostly treated by topical administration in the anterior fornix of the conjunctiva. Nevertheless the procedure is extremely inefficient because when a drop is instilled in the eye, the ophthalmic drug has a short residence time in the conjunctiva sac, less than 5 minutes. Moreover, only 1-5% of the applied drug penetrates in the cornea reaching the intraocular tissue. To avoid the drawbacks of the topical administration, therapeutic lenses were designed to increase the ocular bioavailability of the ophthalmic drugs. A polymer is combined with drug in a such a way that the release profile is predefined. Several types of lenses were proposed: simple polymer membranes with dispersed drug, polymeric platforms with dispersed particles encapsulating drug and multilayer lenses. The main objective of this work is to study the drug evolution in the anterior chamber when different polymeric platforms are used to deliver the drug. Mathematical Background: Analysis, Differential equations, Computational mathematics. Participants: Amadou Yoro Thiam (University of Joseph Fourier, Grenoble, France), Billy Braithwaite (University of Jyväskylä, Finland), Emmy Sjöstrand (Lund University, Sweden), Javier García Bautista (University of Santiago de Compostela, Spain), John McGowan (University of Strathclyde, Scotland). This project address the problem of a firm that is facing uncertainty about future revenues, but has the option either to invest in a new product, market or technology, suspend production or even exit the market, according to its expectations about the future. These options can be exercised now or latter, and there are irreversible costs, meaning that the options are irreversible. This is the typical framework of real options analysis. Mathematically speaking, the problem is an optimal stopping problem (in some cases, like when the options involve investment or exit) and an optimal impulse problem (for instance, when the firm may suspend temporarily its production). We study also the influence of market expectations and costs in the overall optimal policy. Using simulation techniques, we also pretend to study the behavior of the times to undertake some action. Mathematical Background: Stochastic differential equations, Monte-Carlo simulations, Basic knowledge of probability and statistics. Participants: Ana Pavlović (University of Novi Sad, Serbia), David Masip Bonet (Autonomous University of Barcelona, Spain), Joel Jonsson (Chalmers University of Technology, Sweden), Hamed Mohammadi (University of Joseph Fourier, Grenoble, France), Sylvi-Maria Gurova (Sofia University, Bulgaria), Wen Shi (University of Oxford, United Kingdom). 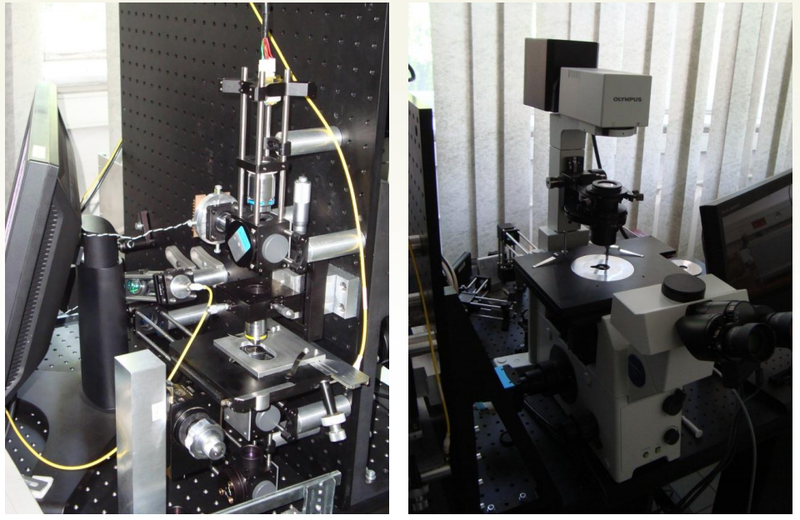 In the proposed project students will model the optical tweezers setup and try to interpret the real data obtained using such equipment. 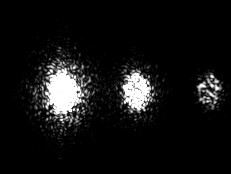 Optical tweezers are a form of optical trap allowing to manipulate micro-sized objects embedded in a liquid using laser light. They are now used in medicine, e.g. to sort cells and move DNA chains. Above that, the behaviour of the trapped objects (the simplest is spherical polystyrene bead) gives insight into the nature of the bead's surroundings, for example the type of diffusion. During the project, the students will be given basic information about the properties of the optical tweezers system, allowing them to propose a physical model for the simplest case of such system (spherical polystyrene bead embedded in water). The sensible models are generally variants of the stochastic harmonic oscillator. Next, they will be given real data (films and recordings of the bead's position) in order to verify and calibrate the proposed model. One of the most important challenges will be to detect the distortions to the original data caused by the camera and external influences (e.g. vibrations of the setup). Some of the given recordings will be relatively free of these disturbances, and some will be highly disturbed; the student's task will be to distinguish them and propose methods to effectively extract important information from the disturbed data. The advantage of the proposed topic is that it can be studied at different levels of expertise in the subjects. The optical tweezers are widely studied by the people with background from optics, who have little to no experience with stochastic modelling. They use basic and simple methods like studying mean, variance and performing Fourier transform of the data. At the same time, more advanced methods, like time series analysis, can also be effectively used. 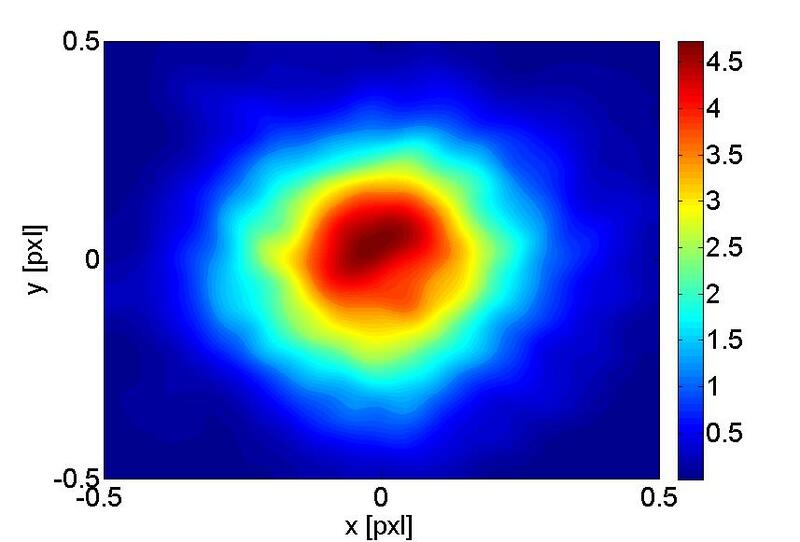 Optical tweezers data are in fact very good examples to learn such techniques, because their model is relatively simple and these methods are intuitive in this case. The students can try using various techniques, starting from most basic to more advanced, and check which of those are most efficient. From my experience, dealing with this data is a very good experience, as it shows many difficulties that appear when we try to apply mathematical and statistical modelling in real life. They teach how to propose and verify research hypotheses and how to recognize truly important properties of the system. Mathematical Background: Analysis, Ordinary Differential Equations, Probablity, Statistics, Programming. Only basic level will be necessary. Participants: Chiara Amorino (Università degli studi di Milano, Italy), Daniel Salgado Rojo (Autonomous University of Barcelona, Spain), Dimitar Fidanov (Plovdiv University, Bulgaria), Marsel Cornely (University Koblenz, Germany), Matti Aleksanteri Eskelinen (University of Jyväskylä, Finland), Pontus Andersson (Lund University, Sweden). Fig. 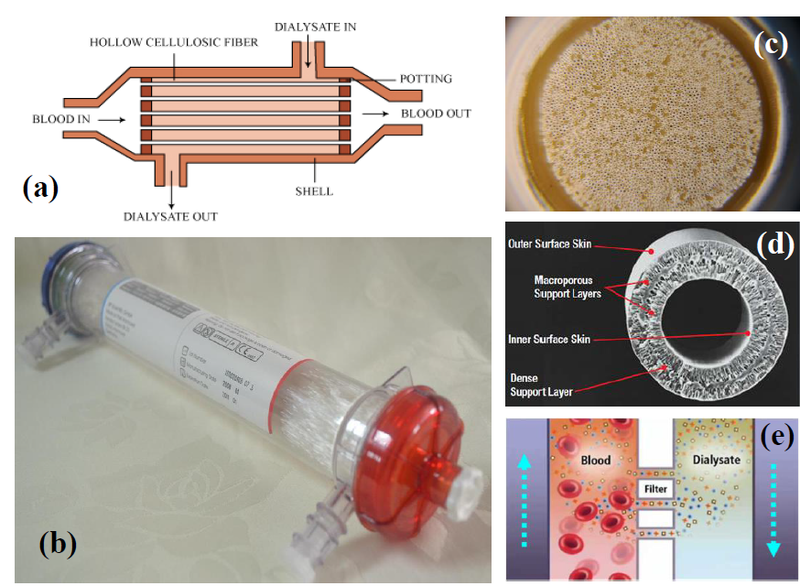 (a): Schematic of the membrane cartridge configuration; (b) actual haemodialyzer cartridge; (c) front section of the cartridge, the small apertures are the inlet to the hollow-fibre membrane tubes; (d) single hollow-fibre membrane; and (e) mechanism of dialysis.. In this modelling problem we aim to quantify the urea mass transport through the membrane, to predict the time required for dialysis. The key modelling input variables, such as blood urea concentration, rheological constants and blood flow rate, can be easily measured by simple clinical tests. The modelling results will also provide insight on the effectiveness of the process and allow for its optimization within the physical constraints to maximize the transport rate. Mathematical Background: Ordinary and partial differential equations (essential); numerical methods and knowledge of computational packages e.g., COMSOL/FENICS/FLUENT helpful but not essential. Participants: Antoine Zurek (Université Lille 1, France), Begoña Nicolás (University of Santiago de Compostela, Spain), Mladen Valkov (Sofia University, Bulgaria), Niklas Lundström (Lund University, Sweden), Panagiotis Kaklamanos (Technical University of Denmark, Denmark), Rainer Schneckenleitner (Johannes Kepler University Linz, Austria). We are concerned with hunting areas of red deer population. We consider areas that are enclosed, so that men can have a great influence on breeding. This project aims at improving the strategy for production of the red deer trophies, which is the main goal of the management. In general, the management of one hunting area is mainly driven by a ten year timeframe document, the so called Game Management Plan. First of all, an optimal number of species is determined for the hunting area under consideration, depending on conditions for peace, environmental, climate and vegetation conditions. For each year (within the interval of ten years) it contains the following data: number of species at the beginning and at the end of the hunting year, increment, planned losses and harvest. To predict the number of species and increments, simple models (based on experience) are used. Harvest is planned in such a way that it ensures 2 tasks at the same time: to reach the prescribed optimal number of species at some moment, and to produce trophies. A negative consequence on trophies production in enclosed hunting areas is inbreeding. In order to prevent inbreeding, red deer should be imported from another hunting area. Such an action is highly expensive, and therefore should be carefully planned. The task of this project is to estimate the time at which the population of red deer should be imported from another hunting area, as well as an optimal structure (regarding gender and age) of the imported red deer population. The data (more precisely, the two Game Management Plans) from one hunting area in Serbia will be provided. Mathematical Background: Statistics, Differential Equations modeling Population Dynamics, Computational Skills (basic). Participants: Antigoni Kleanthous (University of Oxford, United Kingdom), Essi Rasimus (Tampere University of Technology), Irina Espejo (Autonomous University of Barcelona, Spain), Rénald Chalayer (Université Blaise Pascal, France), Sara Battiston (Università degli studi di Milano, Italy), Vasil Pashov (Sofia University, Bulgaria). The block ciphers are a particular class of cryptographic algorithms. They are fundamental to present cryptography and they are the most widely used cryptographic primitive. Shannon in his paper Communication Theory of Secrecy Systems, 1949 introduced the ideas of confusion and diffusion for practical cipher design. The basic operations of substitution and permutation are of special interest to achieve these ideas. Substitution is often used as a way to provide confusion within a cipher. Typically, substitution is achieved with a suitably designed lookup table, substitution box, or simply S-box. So S-boxes introduce non-linearity on word level. What is it that makes one cryptographic algorithm better than another? The S-boxes involved in the algorithm are of major importance. They have to be carefully chosen to posses specific security properties. An n-bit to m-bit substitution box (or S-box) returns an m-bit block if given an n-bit block. Such an S-box can be described by a table of 2n elements of m bits. S-boxes can be considered as vectorial Boolean functions, so their cryptographic properties can be derived from the relevant Boolean functions. The Boolean functions can be represented in different ways - as truth table, algebraic normal form, numerical normal form and with trace representation. The Boolean function properties depend on its Walsh spectrum, autocorrelation spectrum, truth table structure and algebraic normal form. A cryptographically strong S-box should satisfy a number of critical properties. Among them are non linearity, strict avalanche criterion, correlation immunity, balancedness, delta uniformity, transparency order and high algebraic degree. To derive an S-box properties it is needed to consider all non-zero linear combinations of the corresponding Boolean functions. This scope of the task makes it very sensitive to the used computational techniques. Different algorithms to evaluate all admissible cryptographic properties of S-boxes will be discussed. Tools for S-box analysis must be developed. Mathematical Background: Finite fields, Computational skills and programming skills (C++ or Matlab). Participants: Alejandro Molero Casanova (Autonomous University of Barcelona, Spain), Bernardo Amaral (University of Coimbra, Portugal), Maximilian Ludvigsson (Chalmers University of Technology, Sweden), Ronak Molazem (University of Joseph Fourier, Grenoble, France), Stanislav Darachev (Sofia University, Bulgaria). Under Black’s model, financial derivatives prices are determined by the volatility of the underlying variable. In the so-called fixed income market, the volatility of the forward interest rates are basic inputs in the pricing formulas. In order to find the price for complex fixed income derivatives, it is essential to know the complete list of volatilities of the forward interest rates (the “term structure of volatilities”). Unfortunately, this parameters are not directly observable in the market, and they must be inferred from quoted prices of complex contracts. Our aim is to explore the numerical implementation of an algorithm to find the forward volatility curve from quoted prices of caps and floors. This is known as “volatility stripping” and involves an understanding of the pricing formulas and the solution of a nonlinear optimization problem. Mathematical background: Computational skills (Matlab or, preferably, the open source Julia Language). Some knowledge of financial mathematics is welcome, but not essential. Basic knowledge of probability and numerical methods. Participants: Adriana Cola (Università degli studi di Milano, Italy), Joachim Lübbers (Technische Universität Dresden, Germany), Mirko Dražić (University of Novi Sad, Serbia), Olavur Mortensen (Technical University of Denmark, Denmark), Riyaz Mouhamad Saly Abdoullah (Université Paris 13, France), Slavi Georgiev (University of Ruse, Bulgaria).